RESTORE® Brief with Remedy™: Advanced skin protection is built into every Restore disposable brief. That's because each inner liner is coated with Medline Remedy Skin Repair Cream. This exclusive, all-natural cream helps protect delicate skin. 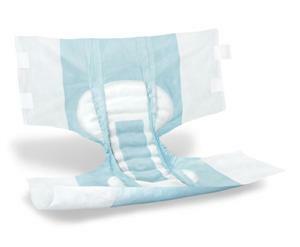 These briefs also feature soft, breathable side panels for increased airflow and comfort, super-absorbent UltraCare core to help provide maximum dryness for improved comfort and healthier skin, skin-safe "grab anywhere" closure system that helps reduce waste and promote skin health, and anti-leak cuffs to help protect clothing and bedding. .The cloth-like outer cover is comfortable against skin, helping minimize the risk of irritation and rashes. Size Medium, 32"- 42" (81cm - 107cm). 96 ea/cs.